Quick aside: I think we've already made it pretty clear that we're playing pretty fast and loose with the "July" part of "Christmas in July". As long as it's Christmas being celebrated in the wrong month, it counts. That said, there's virtually no Christmas being celebrated in this episode whatsoever. The whole thing seems to be a quick gag, present for a single scene then abandoned. The conceit is that John and his war buddy were once POW's together, and they wound up losing track of time. Their calendar got a few months off, so they were accidentally celebrating Christmas in February. They made it an annual tradition, which has continued to this day. You got all that? Great - forget it, because it's not coming up again. 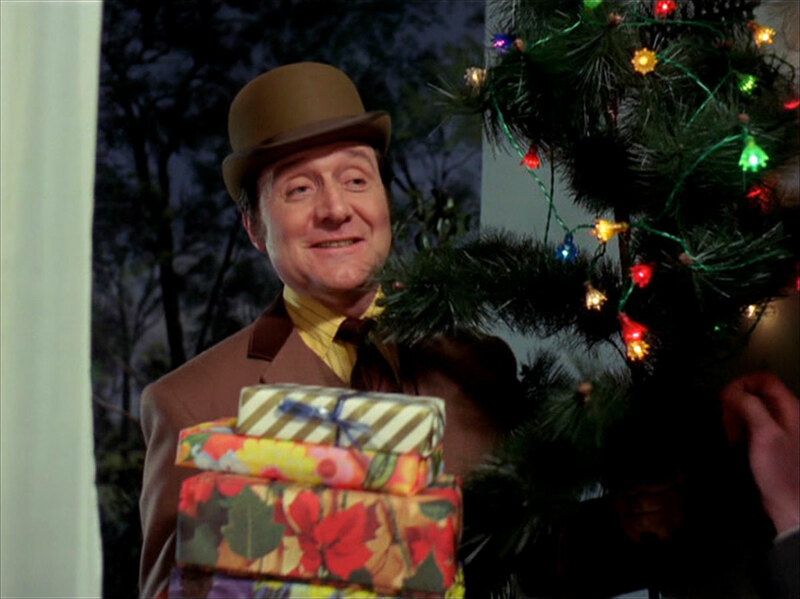 See, Steed's friends are currently being held hostage when he arrives. He doesn't realize at first, because their captors have implanted miniature explosive pellets in their necks and are threatening to detonate them if Steed catches on. Forced to play along, the whole thing becomes an elaborate game of life and death. Eventually, they wound Steed while hunting, and he manages to trick them into believing he's stumbled into a bog and been swallowed up by mud. He gets back just after Tara reappears, and the two of them stop the villains from assassinating a bunch of diplomats with a missile. I suspect that sounded significantly more zany than it actually was. Unlike most episodes, this one was relatively serious in tone. Fortunately, the synopsis also reads a lot dumber than the episode came off. For all the weird turns, this delivered some decent suspense. It helped that the villains were at once fascinating and disturbing. The lead bad guy had a fantastic voice that was simultaneously refined, commanding, and chillingly evil. The other significant villain was the brilliant young woman who invented the exploding capsules and the method for surgically implanting them. Her character comes off as eerily alien - she seems less evil than completely detached from human feelings. She's sort of a playful sociopath existing in her own world. There are still quite a few bad decisions in the episode: the bog thing makes very little sense, it's not clear why Steed doesn't do more earlier, and the villains make a handful of mistakes. But the bad guys and the suspense succeed in redeeming this, at least as a standalone story. As I said earlier, the holiday elements are basically present as an extended joke. Still, it offers an interesting look at the Christmas in July trope (even if it's off by five months). In this case, it's a holiday tradition with an interesting origin story. I'd certainly have liked more time on it (it was something of a plot point that his friends had forgotten all about it due to the home invasion), but it was a fun idea.